Precious Oil - Just Beauty Products, Inc. Intensive treatment that brings softness and discipline, to combat the frizzy hair. Contains Pequi Oil and Prickly Pear Oil that reduce the roughness of the hair shaft, leaving the hair more manageable. Hair stays soft, shiny and in place at all times. Paraben, paraffin, colorings, and allergen free. Precious Oil There are 2 products. 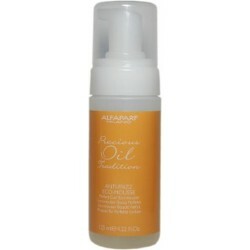 Alfaparf Precious Oil Tradition Anti-Frizz Eco-Mousse 125ml/4.22oz. Ultra-Light Fluid that turns into an eco-mousse to discipline and counter the frizz of curly hair. Paraben, Paraffin, Colorings and Allergen Free. 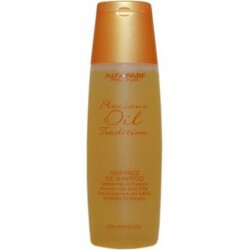 Alfaparf Precious Oil Tradition Anti-Frizz Oil Shampoo 250ml/8.45oz. Innovative sulphate-free oil shampoo formulation combining a delicate cleansing action with an intense detangling and disciplining effect to leave hair soft, supple and extremely easy to comb.